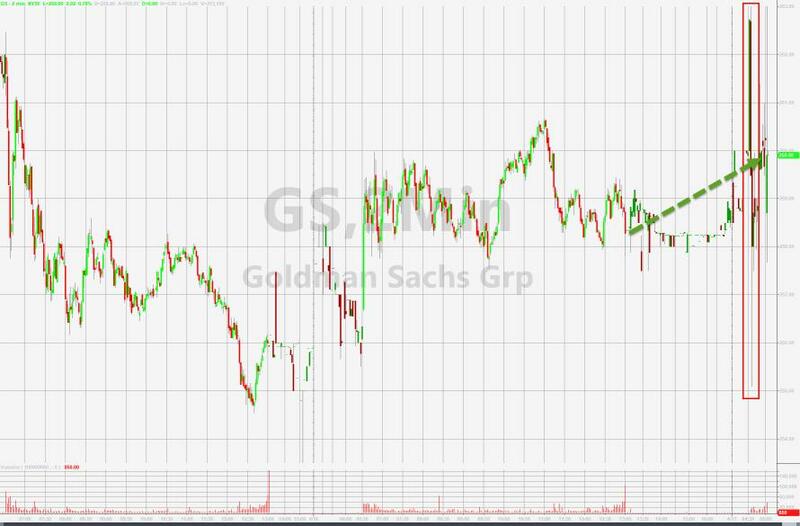 If there is anything the recent reports from money center banks showed, it was the the February volatility surge was a gift to bank equity trading desks, which is why Wall Street was eagerly anticipating this morning's Goldman Sachs results to see how much the "cleanest" trading desk on Wall Street would benefit from the turmoil in Q1. 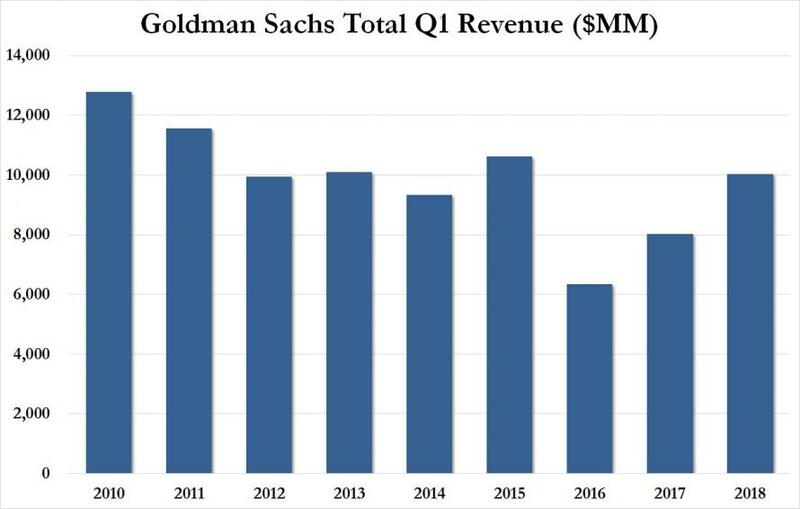 So to avoid the noise from the swing in the tax rate, we looked simply at the top line and it was here that Goldman truly shone, reporting total Q1 revenue of $10.04BN, up 25% Y/Y and not only smashing consensus expectations of $8.74BN, but above the highest Wall Street estimate, mostly thanks to equity trading and its prop desk. 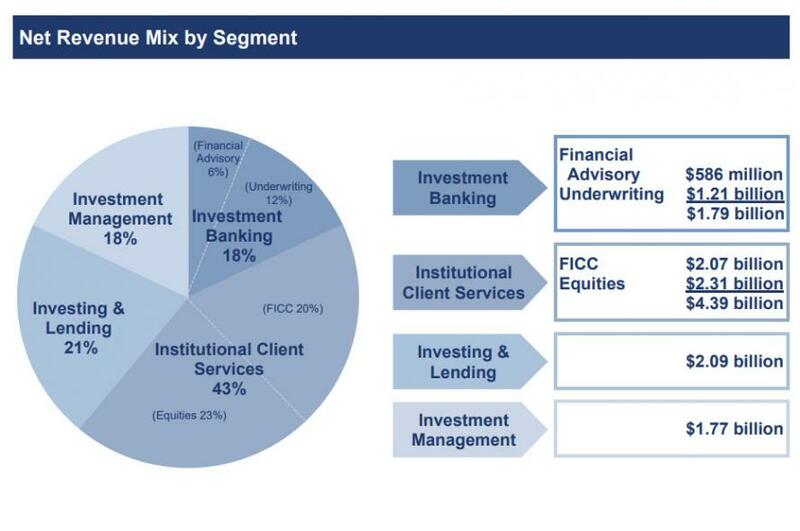 On the other hand, both investment banking ($1.79 billion, vs est $1.71 billion) and FICC sales & trading ($2.07 billion, est $2.04 billion) failed to make a notable mark, just barely beating estimates, in line with results previously reported by both JPM and BofA. This is how the outlier quarter looked like in context - the best since Q1 2015. 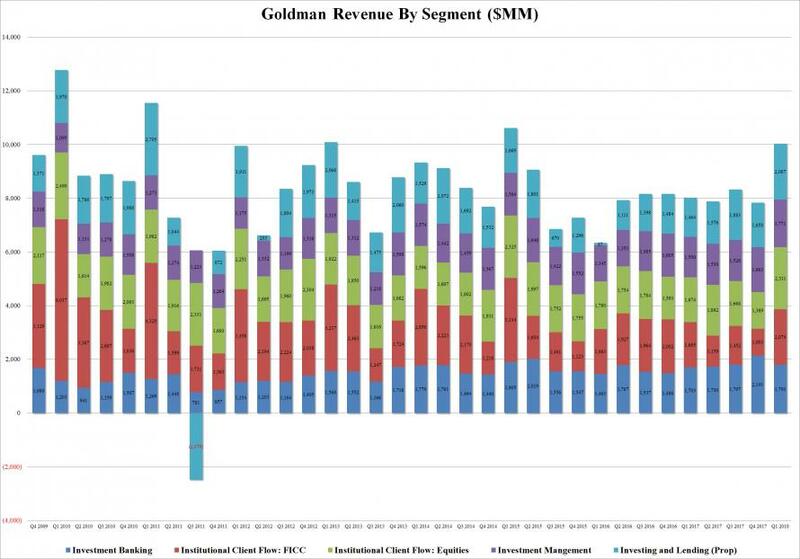 Is the downward slope in Goldman revenue finally over? Perhaps, but we will need to see a sustained increase in vol for that to be the case. Also notable: Goldman boosted its comp 50 $4.1 billion, or a 41% compensation ratio. The result was an average compensation of $340,000 for the average Goldman employee (of which the company had 37,300 in Q1, an increase of 700 from the previous quarter). As Goldman notes, "the accrual for compensation and benefits expenses (including salaries, estimated year-end discretionary compensation, amortization of equity awards and other items such as benefits) was $4.12 billion for the first quarter of 2018, 25% higher than the first quarter of 2017, reflecting a significant increase in net revenues. The ratio of compensation and benefits to net revenues for the first quarter of 2018 was 41.0%, unchanged compared with the first quarter of 2017. Total staff increased 2% during the first quarter of 2018."